A straight-edged blade is very easy to sharpen. Hence, it will remain genuinely sharp during the whole period of service. The label inside the case might eventually come off, leaving marks on the interior. However, these marks can be easily removed. This sleekly shaped and finely crafted set is created for all fans of terrific steaks! 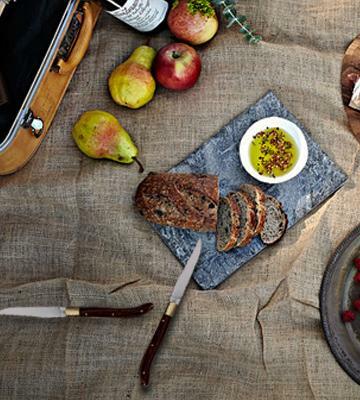 Premium-quality razor-sharp knives will give you an opportunity to fully enjoy every bite. A beautiful Pakkawood handle smartly combines the best features of wood and plastic. Along with elegant and eye-catching look, it offers durability and strength. The case lock is not tight so it might open accidentally. Just an amazing idea for a gift! A top-notch quality set in an exclusive wooden case will look attractive and become a useful kitchen tool in any household. The blade is only partially serrated. And it means that this supreme knife will perfectly cope with any meat chunk from a juicy rare beef steak to a well-baked pork chop. You will always get finely cut and flavorful slices. The handle might get rubbed after a long-term use. AmazonBasics set features an outstanding combination of a refined classic style and high-performance characteristics. Besides, it offers an optimal price to quality ratio! An all-forged design makes the knives look elegant and stylish. 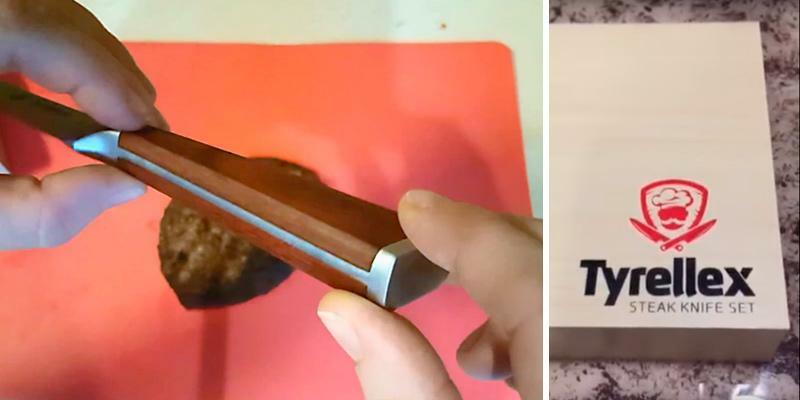 And thanks to the design, you can clean these knives in a dishwasher. The stainless steel handle may slip out of wet hands. 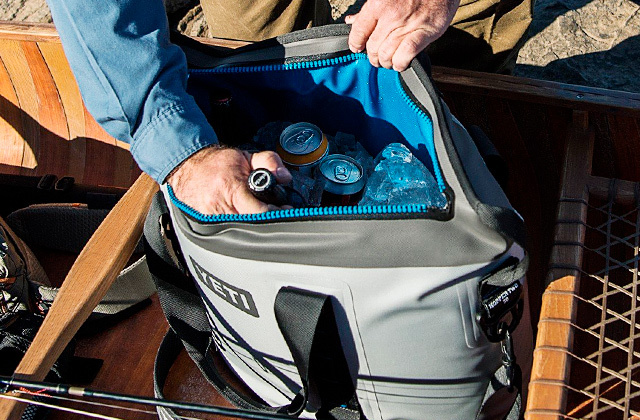 Henckels set is a practical solution both for everyday and occasional use. Owing to its durable yet attractive stainless steel design, these incredible knives will serve you faithfully for years! Forged with durability and sharpness in mind, this great knife has a specifically sharpened blade to prevent food sticking while cutting. An extraordinary knife handle might seem a bit inconvenient. But this feeling will fade away as soon as you start using the knife. Do you want to turn your everyday meal to a festal dinner? If so, this nice multi-color knife set is for you. 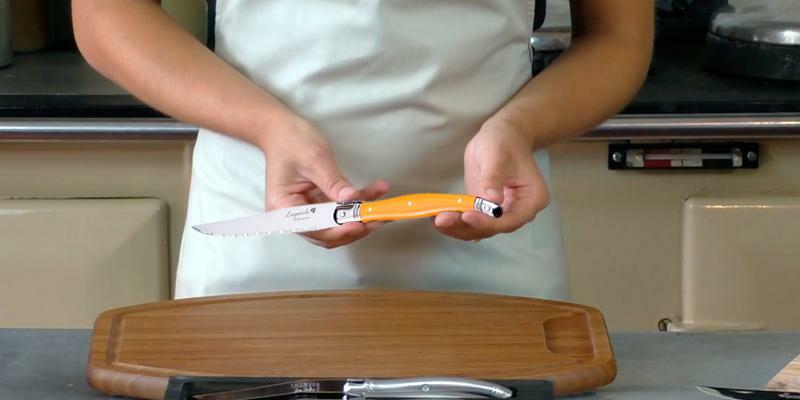 With Flyingcolors knives, slicing palatable steaks is a breeze. Meanwhile, they will add fun and style to your dining table. 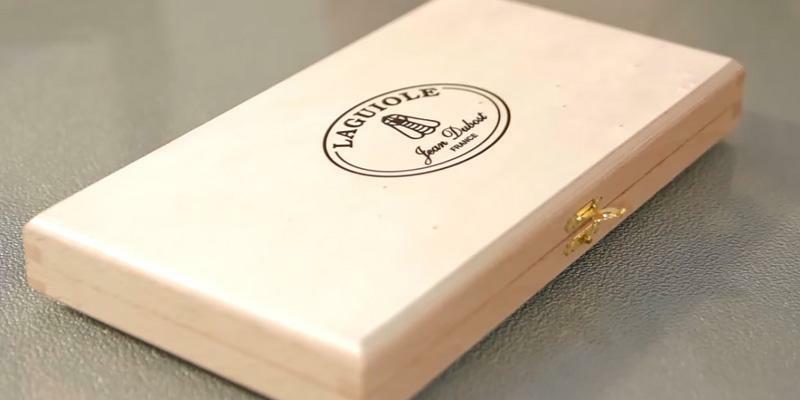 The official history of Laguiole goes back to 1829. 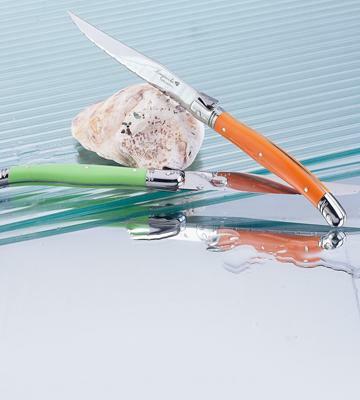 The first knife was made in a small Laguiole village in the south-west of France. The founders of the knife were inspired by the local fixed blade knife "Capuchado" and by the long Spanish Navaja folding knife. Initially, the knives were used for common everyday tasks such as broom peeling for basketwork, belts making and any other household activities of peasants in the village. In 1840, Laguiole manufactured an awl, and in 1880 they added a corkscrew, an important tool for retailers selling beer in Paris. In 1981 Laguiole Knife Association was established to develop and promote the knives that gained a worldwide fame. Today, Laguiole owns a factory, forge shop, and several workshops. The majority of knives are assembled automatically on the conveyor. However, some exquisite premium series are still produced manually. And some workshops are open for tourists all year round to tap into the production process of prestigious Laguiole knives. Nowadays, the majority of Laguiole knives belong to kitchenware and table cutlery. 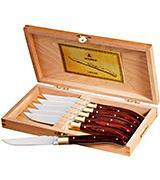 And an amazing Laguiole Steak Knife Set is not an exception. The first thing that will surely catch your eye is a stylish smooth to the touch wooden case decorated with sleek metal hinges and lock. The keepsake box is adorned with a company brand name. Inside you will find 6 state-of-the-art knives with the length of 9 inches. Just take one and all at once you will feel the premium time-honored quality. A replaceable wooden handle is polished and processed to perfection. The waterproof capabilities contribute to the supreme durability of these knives. Even if you take the knife with a wet hand, it will not slip out and you can hold it comfortably. Yet, the manufacturer recommends refraining from cleaning these steak knives in a dishwasher to preserve their nice look and prolong their service life. This knife set is incredibly attractive and will become a memorable and desirable gift, a decent and useful complement to any dining table and tableware. A sleekly shaped blade made of first-class steel is resistant to stains and rust. Besides, a razor-sharp straight edge allows for quick and precise cutting of even the thickest roasts. You will get finely cut appetizing bites with almost no effort. The main advantage of a straight-edged blade is that you can sharpen it whenever you need to enjoy easy and smooth cutting during the whole period of service. All 6 knives are hallmarked with a bee image – a Laguiole trademark and a sign of exceptional craftsmanship. 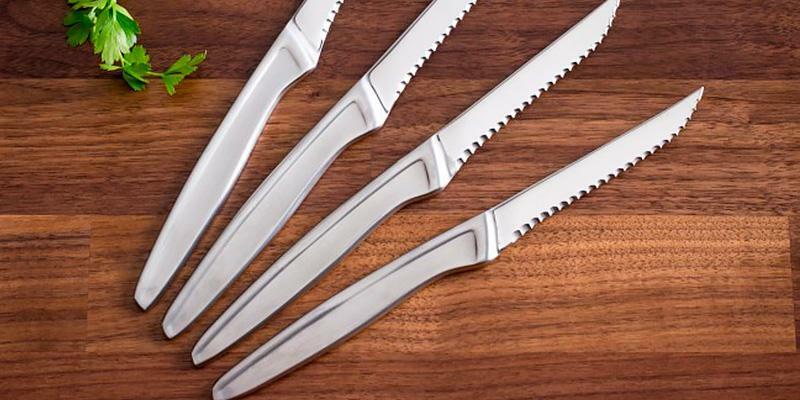 To sum up, we can state with confidence that this stainless steel knife set will demand notice on any tabletop. When we speak of Laguiole products the brand really matters because Laguiole is a synonym for premium quality and perfection! 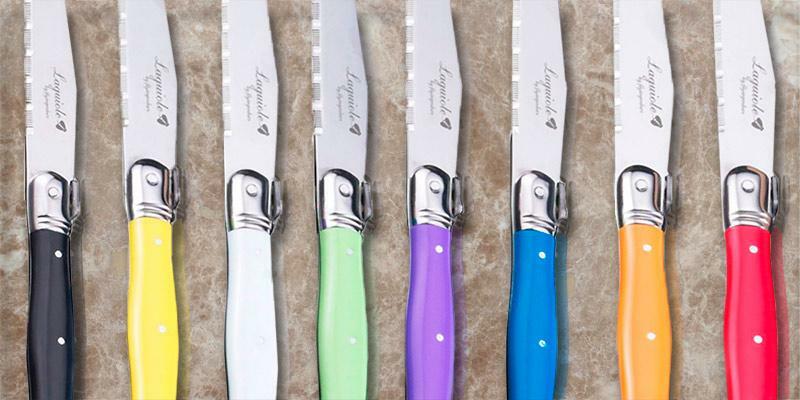 In addition to this knife set, we recommend Laguiole Waiter's Corkscrew. 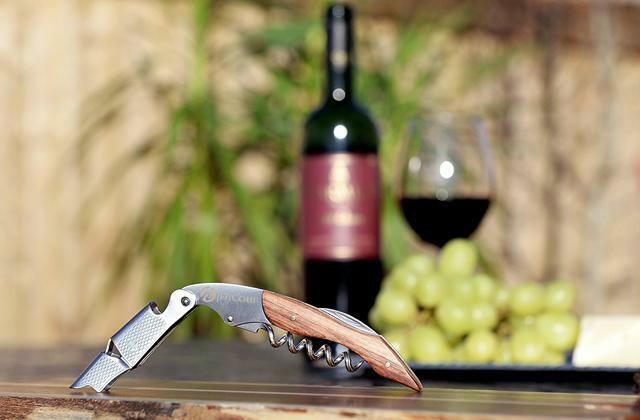 Designed in a similar style with the knives, this great corkscrew will help you open a bottle of ripe wine to complement your T-bone steak or a lamb rib roast. In recent years, we more and more often come across the kitchenware with handles made of such superb hi-tech material as Pakkawood. Tyrellex steak knife is not an exception. It comes with a beautiful Pakkawood handle. It is nice to touch and has an attractive look of polished wood. Many users claim that Pakkawood proved to be much more practical and durable as compared to natural wood or ordinary plastic. Actually, Pakka is a combination of plastic resins and wood. This composite material is waterproof, chemical- and odor-resistant. Besides, the production of Pakkawood is cost-effective. A Pakkawood handle of Tyrellex steak knife is pleasantly heavy, contributing to a well-balanced design, stability, and perfect control. You will simply enjoy cutting with this incredible knife! 6 restaurant-quality finely crafted knives come in a stylish wooden case making this set a decent and worthy gift for a birthday, wedding or even Christmas. The overall knife length is 9 inches, which is an optimal size for this utensil. A serrated blade almost never grows blunt and does not require sharpening. The blade is made of top-notch quality stainless steel ensuring a lifetime warranty from the manufacturer. A full tang handle is ergonomically shaped and perfectly matches the blade. To enjoy your immaculate Tyrelex steak knives over the years and preserve their original elegant look, hand wash is recommended. Try this knife once and you can instantly tell the difference between this one and any other knife you’ve used before! Tyrellex knives manufacture is a family business established in Brisbane, Australia. Today, the knife sets are made in China strictly following all the required standards of quality assurance and control at all production stages. Thanks to this approach, the company offers its customers premium quality products at affordable prices. 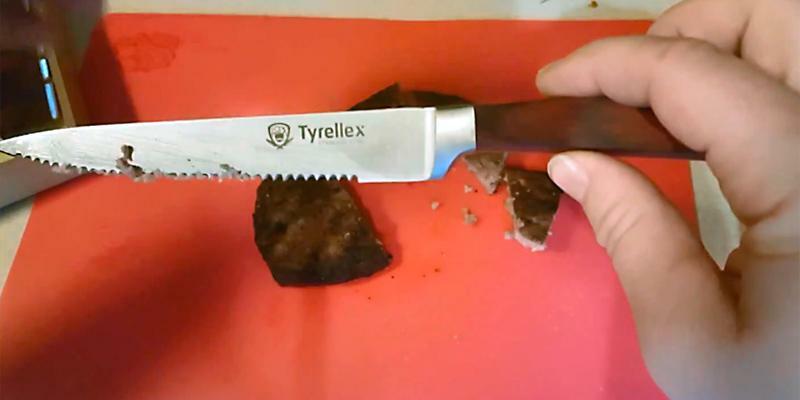 The best knives are usually sold to restaurants, but with Tyrellex you can have them in your kitchen too! A large cookware set would become irreplaceable in any kitchen. A number functional tools will significantly facilitate the cooking process making it really comfortable both for a newbie and for a pro. 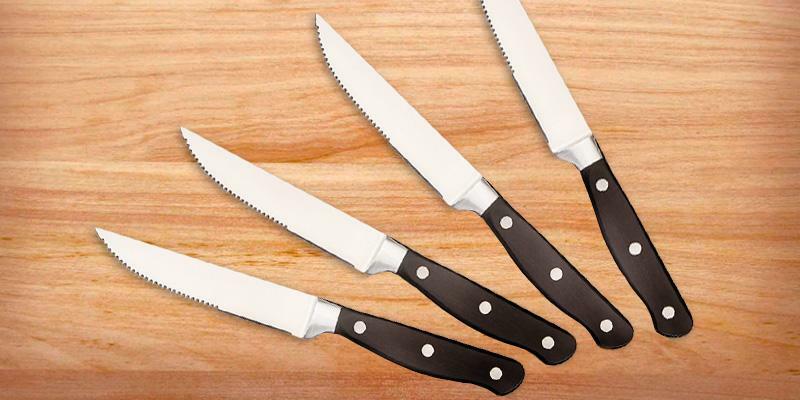 The AmazonBasics set includes 8 knives combining a classic style and impressive performance. It is a perfect choice both for an ordinary family feast and for a dining party with many guests around the table. A 9-inch knife features an excellent steel blade and an outstanding full tang handle for a pleasant weight and good balance. The handle really deserves our attention. It is attached to the blade forged from a single piece of steel by means of three rivets ensuring a comfortable grip. Such design highlights the style and convenience at the same time, providing ultimate strength and durability. Besides, the ergonomic handle is made of high-quality non-porous plastic that makes cleaning a breeze. 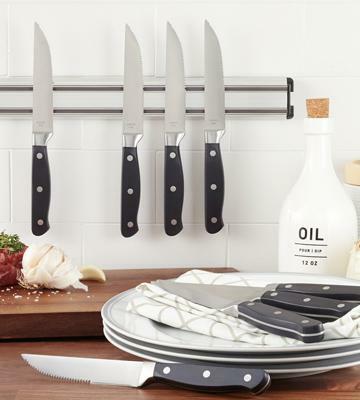 You only need to hand wash these knives in warm water and dry thoroughly. It is easy and will not take much time. Meanwhile, your terrific set will always look good without any traces of rust or stains. Though being affordable, this set of knives looks luxurious and pricey, not least due to a high-quality blade made of top-grade stainless steel. The blade comes with micro serrated edges. But note that a cutting edge is serrated only to the middle ensuring precise and accurate cutting to fine tantalizing steaks. Hence, steak doneness degree is ultimately of no importance! This gorgeous knife will easily cut trough any chunk from a gentle rare steak to a tougher well-done roast. 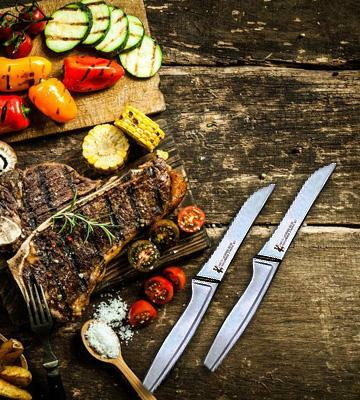 If you become a happy owner of this great knife set, it will add inspiration to your everyday menu giving a chance to try some new delicious recipes and gather all you family members or friends around the table more often. - Meat consists of fats (from 3 to 22%, depending on the type of meat), proteins (17-22%), and water (60-75%). It contains no carbohydrates! 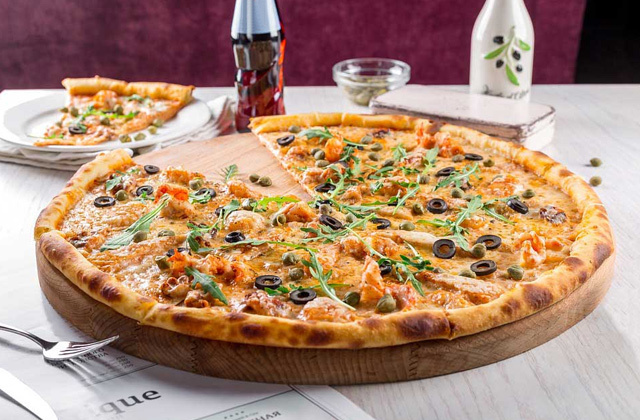 - Numerous surveys and polls results show that bread, meat, and various garnishes are the favorite and most desired dishes of the majority of people. - Healthy low-fat meat is recommended not only for adults but also for children. The flesh of rabbit is considered to be the most digestible. Meanwhile, it contains the maximum essential nutrients. - You will need over 3 tons of soy and grains and more than 150 gallons of water to feed one 2-year cow. In exchange, you will get 650 pounds of meat. - The most expensive steaks are made of meat of the Wagyu cows breed in Kobe, Japan. The cows are treated reverently and with a special care. The Japanese feed them with eco-friendly organic herbs, smear with sake and give them a lot of beer. The price for a pound of such meat runs up to 175 dollars. But this meat is not for export. If you have got a set of steak knives it is a high time to consider an electric grill and enjoy the lip-smacking gentle rare steak or a tougher well-done roast anytime you want. Steak doneness is a common phrase understood by chefs and steak lovers all over the world. 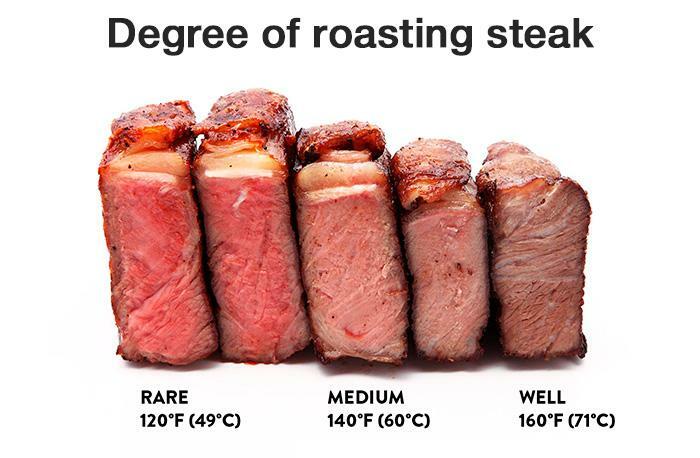 The degree of steak doneness determines the flavor, texture, temperature, and color of your steak. Rare – Meat is seared and browned over the surface and the insides are 75% red. 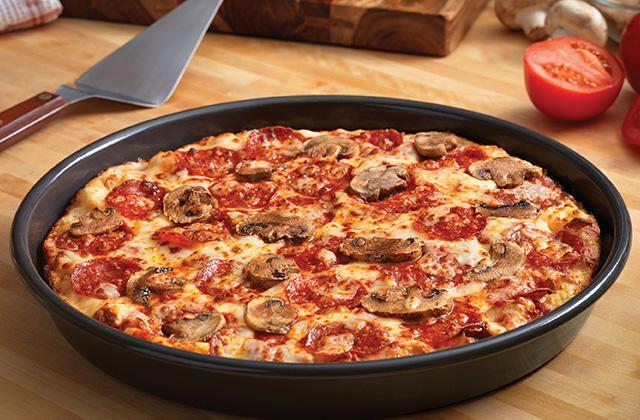 It is a bite for the real carnivores. Rare steak temperature is 120-130 degrees F.
Medium Rare – Juicy and tender steak warm through the middle with a hint of red. The top and bottom should be caramelized to dark brown color. It is a recommended degree of doneness for a good steak. The temperature is 130-135 degrees F.
Medium – The steak is well seasoned and seared from the outside and only 25% of the insides are light pink. The meat is less juicy and has a tougher texture. Medium steak temperature is 140-155 degrees F.
Medium Well – Such steak is cooked throughout and has a hint of pink in the very middle that is barely noticeable. A perfect steak for squeamish eaters who do not like any color in the meat. Its temperature is 155-165 degrees F.
Well-done – completely cooked meat without the faintest hint of pink. A well-done steak is the hardest to cook. It is done slowly to brown the meat through not to burn it. The temperature of such steak is over 170 degrees F.
J.A. Henckels International is one of the oldest trademarks in the world as it was patented in 1731. 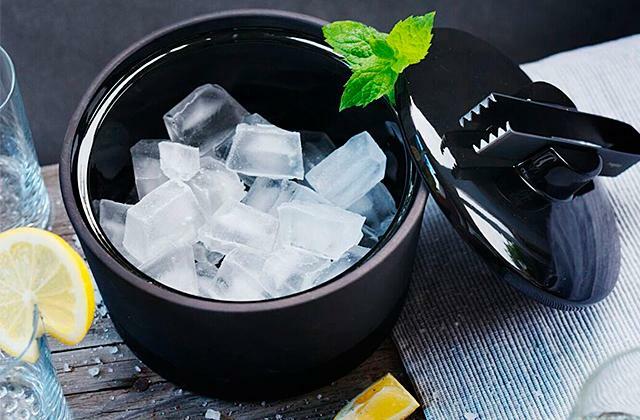 At the same time, this company is a leader in the market of kitchen knives, shears, and other cookware items and kitchen tools we need in household use. The nice and convenient thing is that J.A. 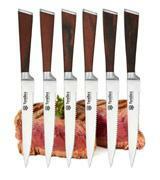 Henckels International Steak Set includes 8 knives. So, if you plan to gather your guests around the table for a festal dinner these stylish stainless steel steak knives will give tone to the table setting. 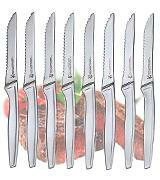 And afterwards, you will surely hear positive comments about the excellent performance of your Henckels knives. Beneficial performance features are ensured by a serrated cutting edge that never needs sharpening. The overall knife length is 8 ¼ inches while the blade length is 3 ½ inches. This well-balanced and precision-crafted knife will cope with all your cutting and slicing tasks. And a durability of stainless steel is proven by a lifetime manufacturer guarantee. It is worth paying particular attention to a unique design of J.A. Henckels knives. The blade and the handle form an integral all forged construction of premium quality stainless steel. The sleek design will perfectly match other flatware like fork and spoon making a gorgeous place setting and giving a modern look to your dining table. The main advantage of the steel design is that such knives are absolutely dishwasher safe. 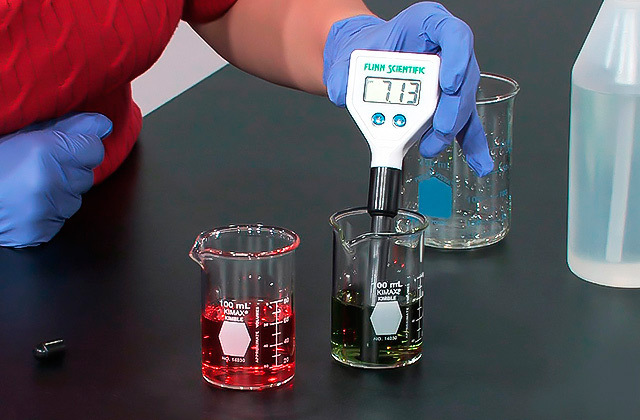 At the same time, this set is stain-, rust- and corrosion-resistant. Hence, even after cutting hundreds of steaks your J.A. Henckels knife will keep its beautiful look and outstanding performance qualities. To get an immaculate stainless steel dinner set, pay your attention to stainless steel dinner fork set. With an optimal length of 7 ½ inches, these forks will look good at your table. And you will get 12 pieces at once. It is worth saying that knife was one of the first cutlery utensils most actively used in ancient times. Some historians claim that it was a knife carved from stone or bone that became the first tool of a homo habilis and not a stick. In 15-16th centuries during their meals noblemen used golden knives with handles made of valuable wood. One interesting legend has it that the first knives had sharp tips, and often in the course of the feast, many people ate right from the tips of their knives. Afterwards, they used a knife to remove food remnants stuck in their teeth. 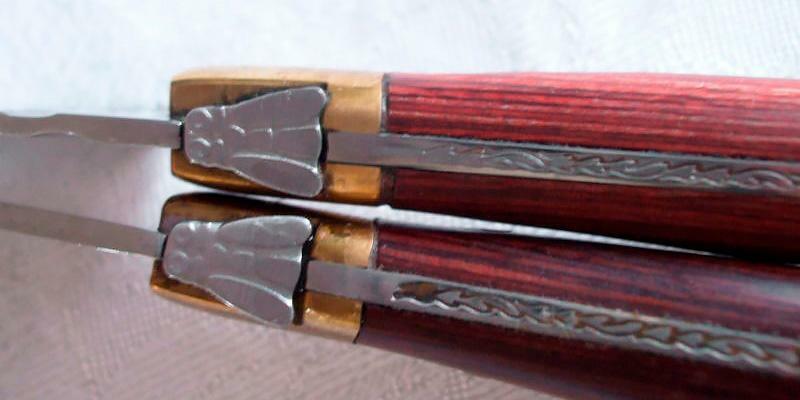 For this reason, to prevent such habits among the nobles, Louis the Sixteenth issued a decree ruling to make only the knives with rounded tips. Fortunately, nowadays we can find a variety of blade shapes and sizes for any occasion. 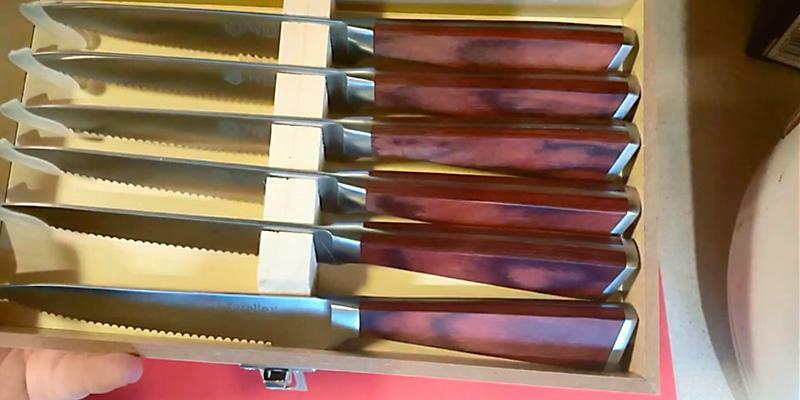 We want to draw your attention to one more steak knife set from a well-known Laguiole brand. A unique Flyingcolors design sets these knives apart from other products on the kitchenware market. 8 knives of this lovely set feature different bright colors that will stand out against other tableware items, adding a special charm to the décor of your dining table. Each 9-inch knife is made of a single piece of steel and forged with durability and sharpness in mind to cut through your sizzling steak quickly and efficiently. 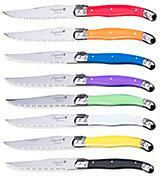 Multi-color ABS plastic handles are full tang, ensuring a comfortable grip and an ideal balance. 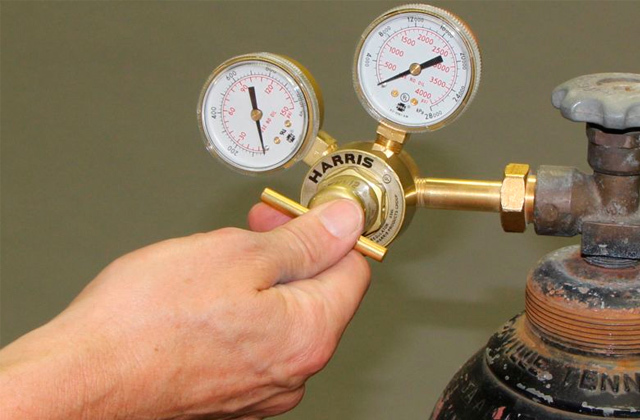 A high-quality triple-rivet fixation provides for exceptional durability. The blade is lined with micro-serrated edges for a superior non-stick cutting. The real benefit of Flyingcolors Laguiole knives is that they are totally dishwasher-friendly. Nevertheless, the manufacture highlights that if you hand wash and wipe dry your knives, they will look brand-new without rust and stains even after several years of active use. This great set shows how an efficient collaboration of two well-known manufacturers allows customers to get a product combining time-honored traditional quality and an eye-catching modern design. These incredible knives will add style to your table contributing to the overall positive tone of your feast or ordinary meal. 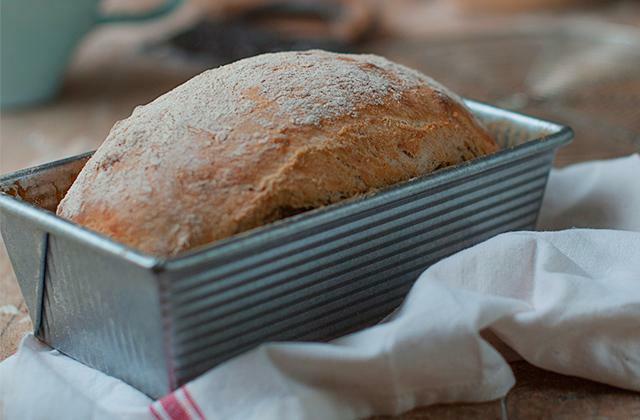 It is the best thing to start your culinary adventure from! If you like vibrating colors of this spectacular set, you will surely appreciate Cuisinart Arista Collection Cutlery Knife Block Set. The set contains 11 items including 7 knives, all-purpose household shears, and a sharpening steel to keep your knives razor-sharp. A wooden knife block will fit the interior of any kitchen. 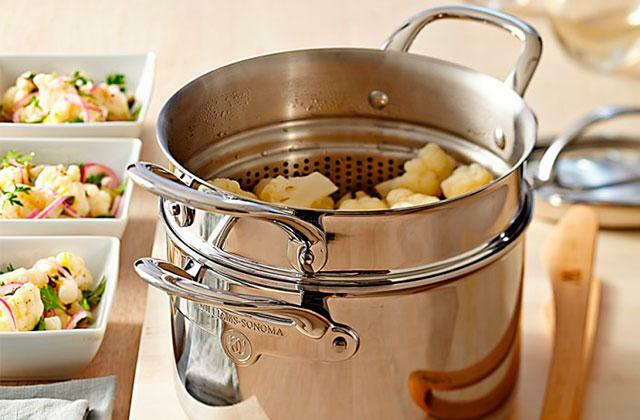 The Cuisinart set will make cooking a breeze! Probably, many of us have been in a situation when a low-quality knife marred the impression of a delicious well-roasted steak. After cooking a savory dish and serving it on a table, the next important issue to think of is a good tool to cut your lip-smacking meat to fine pieces and enjoy it to the full extent. 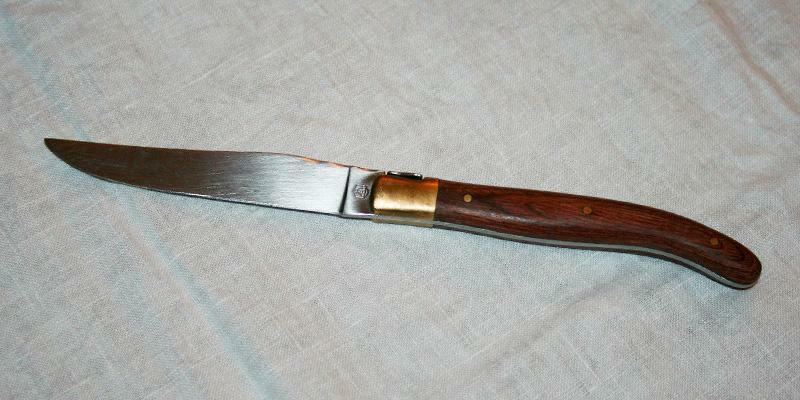 A steak knife was designed for cutting cooked meat. A premium-quality elegant knife is not only a serving and decorative element of a festive table but also an efficient and handy tool to speed a flavorful cut of meat to your mouth. If you want to have the knives that will become your secure and helpful kitchen aid for everyday tasks, check the knife sets. And pay your attention to knife sharpeners to keep your knives razor-sharp all the time. As a rule, a knife set includes several knives, commonly from 4 to 8 pieces for all guests or family members to use at the table. Very often, it comes in a special case for convenient and compact storage when knives are not in use. Additionally, the case protects your knives from damage, keeping them in a good condition and retaining their attractive look. Besides, prime-quality knives in a beautiful case will become a nice and decent present that will come in handy in any household. Usually, cases are made of wood. But sometimes manufacturers use plastic. An optimal steak knife length from the tip to the handle varies from 7 to 9 inches. 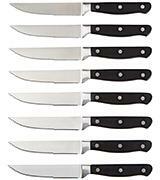 All knives reviewed below have stainless steel blades for a perfect match with other flatware items. 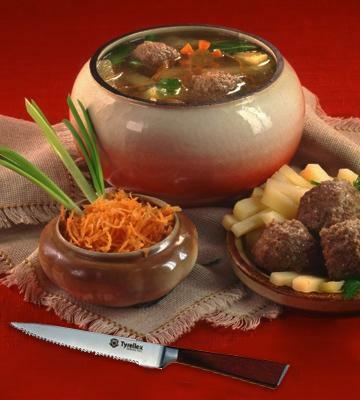 However, today ceramic knives are also gaining popularity and you can often come across ceramic steak knives. Speaking of blade types, there are straight-edged and serrated blades. 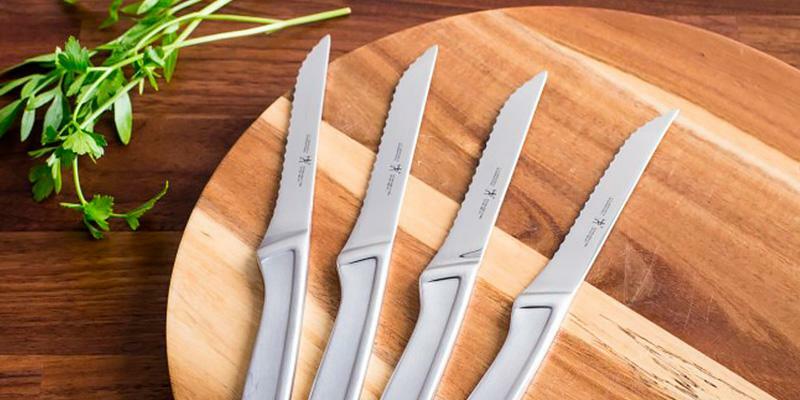 The straight-edged blades ensure smooth clean cuts without tearing meat fibers while the knives with serrated edges are designed for solid food. Though it makes ragged pieces, this kind of blade will easily cut through thick pork or lamb chops, rare or medium rare steaks as well as crusty and crumbling bread and pastry. It is definitely worth saying that serrated blades stay sharp longer than straight-edge blades. However, in most cases, you will not be able to sharpen a serrated knife. Today, we can also find micro-serrated blades featuring microscopic serrations and requiring less effort when cutting a steak. It is interesting that in first-class restaurants the knives with various types of blades are served for the steaks of different doneness degrees. The knife must be comfortable to hold and it shouldn't slip out of your hands even if they are wet. 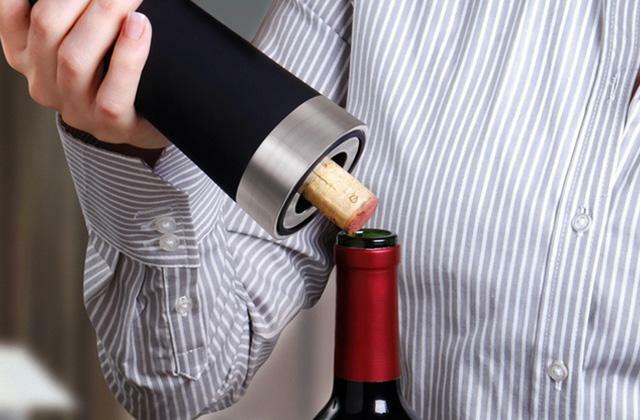 A convenient grip directly depends on a handle. There are all-forged, full tang, and fitted-on handles available. A fitted-on handle is put on a tang while the all-forged handle is actually an extension of the blade. Full tang handles are attached to the tang by means of rivets. As for the handle material, today manufacturers offer a variety of knives with steel, plastic and wooden handles. The handle made of steel is highly durable and gives a knife a stylish modern look. 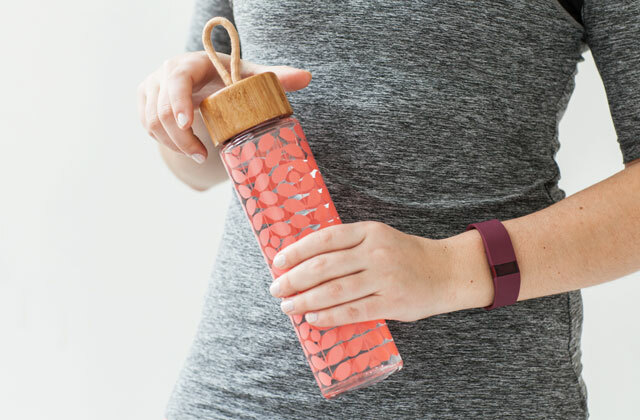 Plastic handles are secure and easy to hold. Plastic is a very flexible material allowing for making handles of different shapes and designs. Sometimes handles feature a soft-touch coating that will ensure a secure and comfortable grip. Traditional wooden handles look terrific, but at the same time, they require some extra care and are not waterproof. Mind, that some knives are not dishwasher safe. For many sets, manufacturers strongly recommend hand washing and drying to keep an attractive look of the knives for years as well as to prevent corrosion. In general, in case of appropriate use, your steak knives will instantly delight you with the ultimate sharpness. 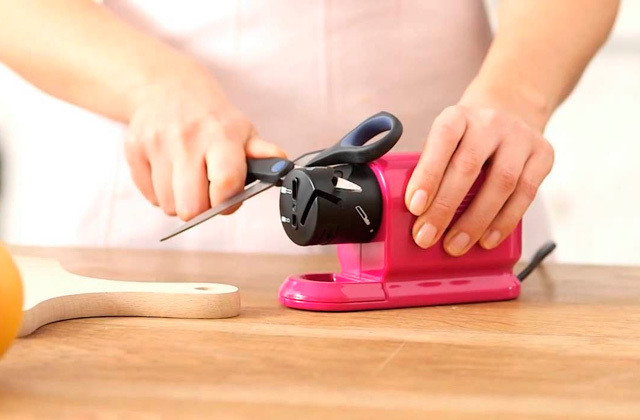 All your family members and guests will be surprised at how easily they can cut food. 1. Lisa Waddle Choosing Steak Knives, Fine Cooking. 2. J. Kenji Lopez-Alt What Makes the Best Steak Knives?, Serious Eats. 3. Jason Kessler You’re Probably Using The Wrong Steak Knife, Food Republic. April 30, 2014. 4. Susan Jung How to choose ... steak knives, South China Morning Post. 5. Tim Heffernan The Best Steak Knife Set, The SweetHome. June 9, 2016. 6. Knife, Wikipedia. July 29, 2016. 7. Derrick Riches Steak Doneness - From Rare to Well, How to Cook a Steak, About.com. 8. The Best Of Beef: Top 10 Steak Cuts, Bodybuilding.com. July 22, 2016.